Skatter Tech recently got access to Hulu, a new service launched by News Corporation and NBC Universal, which offers streaming access to high quality TV Shows and short videos. When we say TV Shows, we don’t mean random content, we mean real actual prime time shows that you would watch on TV such as The Office, Heroes, The Simpsons, House, Chuck, Prison Break, and 24. Even talk shows and comedy sketches including Saturday Night Live (SNL), Late Night with Conan O’Brien, and The Tonight Show with Jay Leno are available through Hulu. The premium content will be distributed by streaming the video directly to your browser using flash player, so no additional plugins or software is needed. The player is quite advance and allows pausing, forwarding/rewinding, controlling volume, and even watching in full screen. And even when I played an episode of Scrubs in full screen, although the frame rate was a bit low, it was still much better than any other service I have seen to date. Viewers will have the ability to email the show to friends or embed them onto their own blogs and web pages. So how much does this all cost? Absolutely nothing! Unfortunately the service is in beta and access is limited to testers, but should be opened to the public soon. 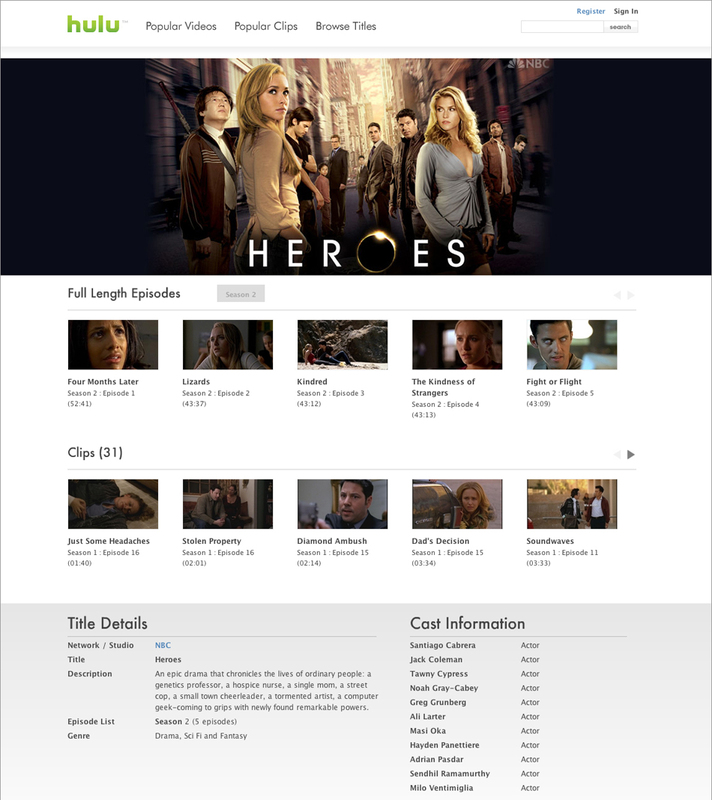 We’ve included a embedded a full video of the latest episode of Heroes for your entertainment. In general, new shows will become available on Hulu once it has been broadcasted on television throughout the United States. (So, after it airs in Hawaii.) TV shows are automatically purged after approximately five weeks or five new episodes of that series has been added to collection. The content will obviously not be available for an infinite amount of time since studios will obviously loose revenue from DVD sales. Despite this, you now have free, legal, and high quality access to all your favorite TV shows. This is probably one of the smartest moves production studios have made in a while. Instead of wasting time suing those who distribute or download copyrighted content illegally through P2P Networks or BitTorrent, they have decided to offer the shows themselves. The studios finally realized that if people are always going to find a way to get their content without paying for it, why not at least give it to them in high quality for free. 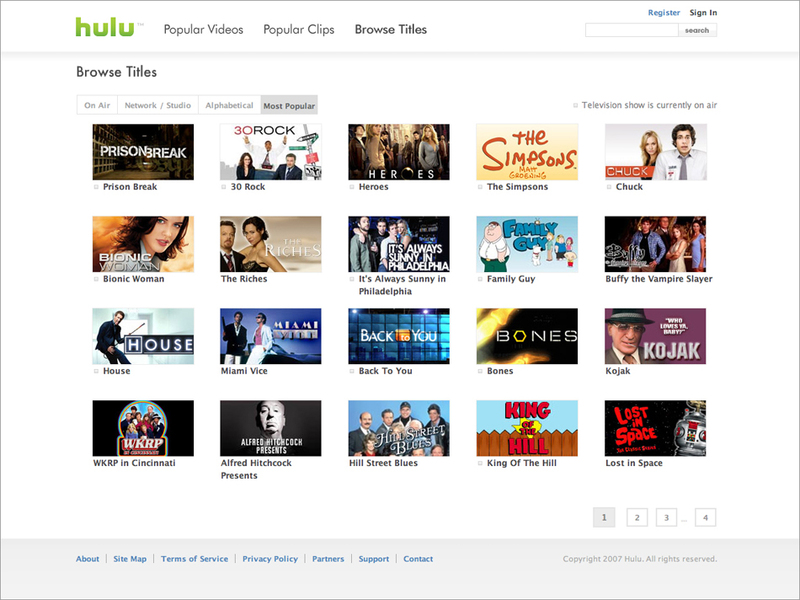 News Corp. and NBC has done by launching Hulu. With this new service, studios are hoping to deter people from downloading their content illegally. The studios will also retain profits since advertisements are embedded into their content. So yes, you’ll have to watch ads. Fortunately they weren’t too bad, there were usually three to four 15-second ads for an hour-long show. Either way, this is a “win win” situation for both consumers and studios, since we get to watch shows for free and that they keep their content locked up in a secure player with ads to retain revenue. As of now, TV Shows will come from 15 different studios including FOX, NBC, Bravo, E! Entertainment, FX, SiFi Network, and USA Networks. (See the PDF for a full list of shows and networks.) Hopefully more networks will join this venture soon.